At long last, I have actually finished reading a book. Yes, really. And not even one for school, which is all I seem to be reading lately, well given the fact that I’m in grad school, it’s kind of inevitable. But today, at Michelangelo’s Coffeehouse on State Street, the book was indeed finished, a feat several weeks in the making. 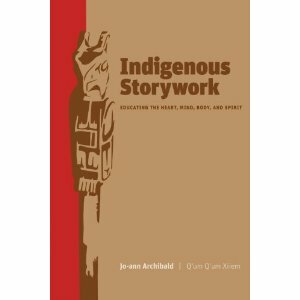 In a turn towards nonfiction, I present to you my review of Indigenous Storywork: Education the Heart, Mind, Body, and Spirit by Jo-ann Archibald aka Q’um Q’um Xiiem. Also, in an effort to bring more international culture into my life, I’m officially counting this as the first country in the ever-popular Read A Book from Every Country contest that probably exists but I just made up. This book represents Canada, and the Sto:lo Nation. from start to finish. On page 11, Archibald provides a helpful chart of her context for all Indigenous storywork. The four concentric circles represent the four levels involved in identity and in the germination of the story. 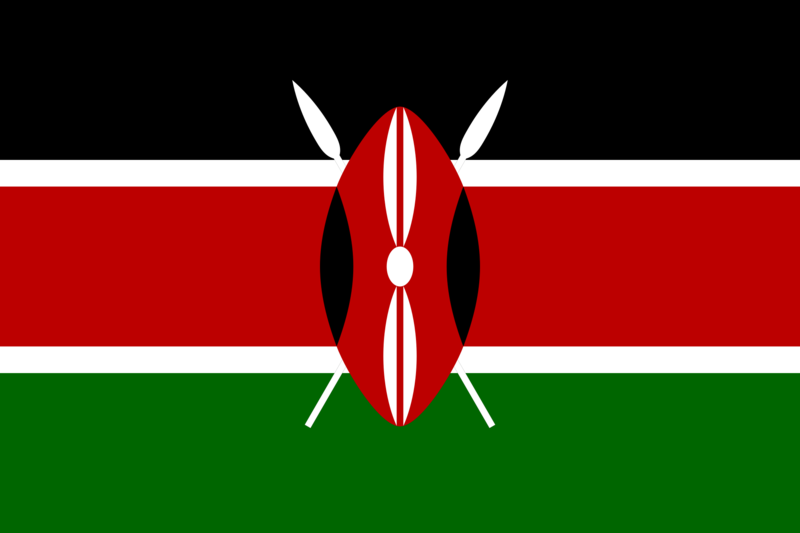 The outermost circle is the nation, and continuing inward, we see the community, the family, and finally, the self. At compass rose points are each of the elements of the human that are in play when telling the story: intellectual, physical, emotional, and spiritual. Discovering the stories is an exciting process, where she realizes the power of the characters and how they can touch lives from young to old, and how they can be used effectively as teaching tools to keep First Nations traditions alive as well as impart valuable lessons. She encounters many roadblocks, though; she deals with the issue of language, translation, and preserving content; intellectual property rights (who do the stories belong to? ); focusing on individual/tribal experiences rather than lumping her work into just “First Nations” scholarship; and the ever-present dilemma of keeping the stories faithful and sacred to the storytellers, possibly risking their extinction, and passing them on, which preserves the stories but puts them in the hands of those who may not use them properly, and for whom the meaning may get twisted. At the end of the book, Archibald compares her work thus far to a “story-basket,” citing the Sto:lo tradition of a basket weaver giving her very first basket to someone who needs it. As the “story-basket” is presented to the reader, it leaves her book open-ended, as if this is just the beginning. For a book, it was pretty dull, but as a monograph, it was quite lively. 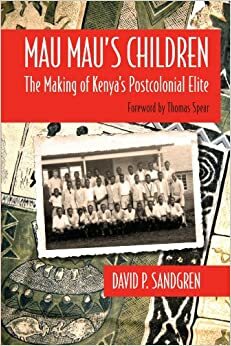 Archibald writes, as others have noted, without jargon, and it is easy to identify with her feelings and emotions as she tracks down various elders and experiments with educational programs. As far as actually telling the stories, Archibald has basically described a more theatrical approach to storytelling, using things like sense-memory rather than rote reading. She also talks about the relationships between the elders, the words of the stories, herself as researcher and herself as storyteller, and makes it clear that each have a different role with one another and all are important in the storywork process; it is a venture that requires collaboration, which in turn requires trust. On a macro level, Archibald is dealing with issues that are present in so many cultural contexts, especially the debate of keeping things sacred by holding them close, or sharing them and guaranteeing preservation but risking defilement, a pretty basic colonial/postcolonial issue. This is where I have not so much a disagreement with the author, but sort of a suggestion/solution. In one chapter (actually, in two) Archibald talks about the search for a story about plants, and getting shut down by the elders due to concerns of mentioning the names of sacred plants and their usage, and the harmful effect that the stories might have on children. For me, this is an example of self-censoring. Surely, the elders know what is and is not appropriate, and by volunteering the information, they themselves are choosing what to share, with the knowledge not that it can or may be shared, but that it will be shared. Archibald also mentions the cycle of tracking down elders and asking for permission, a practice that seemed necessary for the edification of the user but a nuisance for the elder who told the story. I mean, could you imagine calling an author, editor, and publisher, every time you wanted to cite something or use it in the classroom? Archibald does consider this, but is hesitant to accept it. My argument: reality check, look at the big picture. No one is going to be around forever, and even though it’s lovely to keep people involved as they’re still living, there must be some contingency plans laid for when the storytellers eventually leave this earth. Recording the story via text, audio, and video, signing an agreement, and seeing that it’s properly archived should be enough to eliminate at least one, if not all, of the middle-men, and expedite the process. Yes, a story is special, but that’s why there is an agreement in place, as a precautionary measure, to give the story the rights to assert itself, which is basically what Archibald wants. It would eliminate a quarter of the book, at least, but it seems like the only viable option. The most notable sections of the book for me were when the author, instead of questioning herself, interacted with elders from various First Nations and engaged in dialogue with them. On page 50, Archibald gleaned a lesson in reciprocity from elder Vincent Stogan aka Tsimilano, one which she calls “hands backward, hands forward” teaching. This lovely passage encapsulates what she means. Here, Archibald encourages symbiosis, in which the student is also the teacher. Every word heard from the ancestors will be passed on; at least someone in the circle will relate their experiences, even if just to one another, continuing the cycle of learning. Tsimilano’s performative act of embodiment makes the student a vessel for information, a conduit between past and future. This inspired Archibold to pay more attention, and to tell stories in short spurts of comfort rather than in their completion, which is discussed in later sections of the book. Overall, Archibold relays to the reader a sense of giving and receiving, and that storywork is as much about speaking as it is about listening. Oh, and apropos, not only was this the first day in the recent past where my blog views have gone up rather than down, it’s also the first day for visitors from Norway (velkommen! ), Serbia (добродошли! ), and Bosnia & Herzegovina (dobrodosli!) as well as visitors from 30 countries. Keep on coming, write a comment or give me follow? Archibald, Jo-ann (Q’um Q’um Xiiem). Indigenous Storywork: Educating the Heart, Mind, Body, and Spirit. Vancouver: UBCP, 2008. Is This Covered By My HMO? In the past few super-packed days, I’ve actually managed to finish not one but two books. The first I finished on Thursday while riding in the passenger seat of the car, somewhere in Ohio, and the second, earlier tonight. 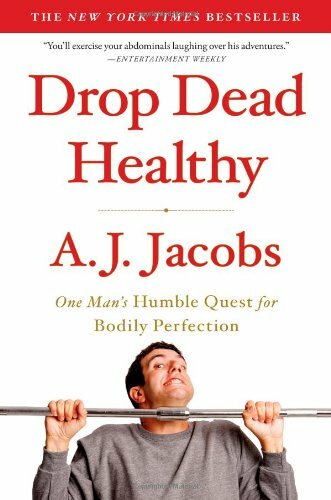 It’s been two days since I finished it, but it won’t be hard to recall my thoughts on Drop Dead Healthy: One Man’s Humble Quest for Bodily Perfection by A. J. Jacobs. 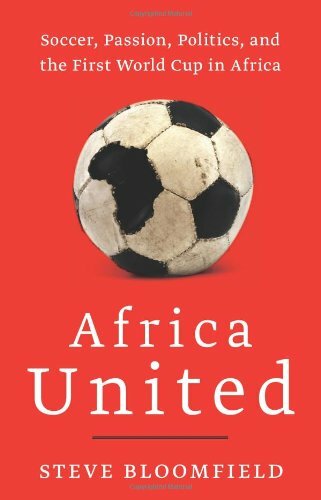 This isn’t the first book I’ve read by A. J. Jacobs. I read his first book, where he read the complete Encyclopedia Britannica, hoping to become the world’s smartest man. I thought it was interesting and hysterical. His second book, detailing a year of living according to the Bible, was one that I decided I could pass on. This third book was on my maybe list, but I found a copy at Book Thing so I thought I’d take a chance. I normally shy away from self-help/health-and-fitness books, because they seem to always contradict themselves. This one was no different, but Jacobs made the meta-contradictions even funnier in his quest. A recurring character throughout the story was Jacobs’ “eccentric Aunt Marti“, sweeping in with phone calls and emails bearing advice about natural foods and the latest cocktail of deadly germs and toxins in our daily environment. She even makes an appearance in one chapter to help cleanse Jacobs’ New York City apartment, which she does to the nth degree. I’m not going to say what happens to her, but suffice it to say she had it coming. Jacobs breaks the book down into chapters, each based on a body part; twenty-six of them, corresponding to the months he spent doing research, providing regular updates with his weight, workout regimen, and other details such as number of bowls of steel-cut oats consumed, or number of miles walked on at his homemade treadmill desk – actually, a nifty way to get some exercise and be productive at the same time (provided your speed is low enough to allow you to type, think, and take strides at the same time). Details on this and some of his other fitness/health/nutrition tips appear in several appendices. I flagged so many pages of the book for new vocab words and funny ideas, as well as a few that I could implement in my own life. Some of Jacobs’ findings, however, are painfully basic, like in his chapter on the stomach, where a doctor whose expertise is in “orthorexia,” or a condition involving an unhealthy obsession with health food. As someone who is constantly between a multitude of eating plans, from “you only live once, so enjoy as much Nutella and Twizzlers as possible” to “if I can’t force myself to eat healthy food, then I’m not going to eat at all” to “yeah, I’m eating healthy…because I can’t put forth the effort to actually make food” to “I had fruit for breakfast so I can have pizza for lunch” and everywhere in between, the nutrition sections were of interest to me. On page 89, Jacobs is incredulous at the nonchalant response he gets of “don’t get fat and get your vitamins” which is like the kindergarten equivalent of basic nutrition advice. But this doctor also suggested to not smoke, drink sparingly, avoid pollution and get some exercise once in a while. I do all those things! Next time I’m feeling down on my body image, I can at least tell myself that I didn’t have a cigarette (26 years clean!) and I walked to State Street (to get a croissant and a cappuccino). Speaking of food, I will never look at graham crackers the same way again: apparently, their inventor, Sylvester Graham, believed that masturbation led to “insanity, weakness, and death” (101) so he invented a treat to lower the libido. He could’ve just gone with baklava; just as good and just as unattractive. I don’t think I’ve ever had a baklava that turned me on. I’m not a big scatology fan, unlike my sons, who can amuse themselves for an entire afternoon by repeating the phrase “crocodile fart.” So I’ll spare you from an overabundance of detail in this chapter. This chapter will be somewhat soft focus, like the TV camera in a Barbra Streisand interview…I found Dr. Gottesman because he’s been included on New York magazine’s Best Doctors list for the last eight years and has written, in his words, a “shitload” of academic articles. The evidence is solid that pets are good for humans’ health. A study by the Mayo Medical Center found that dog owners had significantly lower cholesterol. A study by the Minnesota Stroke Institute said that people who owned cats were 30 percent less likely to suffer a heart attack (though 40 percent more likely engage in scrapbooking). My favorite parts were the appendices. They greeted me like friendly pats on the shoulder, telling me that I’m doing okay in my own life and providing some tips on the easy side, like drinking more water, increasing chewing during meals, and to stop eating in front of the TV. Avoiding all the toxins and constructing a treadmill desk is a bit much for me, but keeping myself in check about eating healthy things and excising stress through meditation, relaxation, and speaking/writing my worries is something I could handle. But seriously, the amount of doctors he goes to for procedures, tests, or chatting? I’d love to read some sort of follow-up chapter cataloging and analyzing all the unusual and/or decrepit waiting-room magazines he encountered. Seeing as the author is pretty obsessive about, well, everything, I’m sure he already has some detailed raw material hiding in a treadmill-typed document or spreadsheet.